Lots of runners, including myself, run alone more frequently than they run with others. But a running partner or group can be one of the most effective training tools to keep you on track and pushing hard, and a great way to keep up motivation. For many runners, having a partner is a must if they want to be successful. And for the other runners, it’s still extremely valuable to swap training ideas and accountability. I recently joined up with a weekly running group in my new hometown of Black Mountain, NC. This will be the first regular group of running partners I’ve been apart of since the Rock Creek Runners group in DC. Even after just a few weeks of training runs with them, I’ve already gotten to know more runners in the community, and have been pushed with new training practices I wasn’t familiar with. But most of all, it’s been a lot of fun. If you currently don’t have a running partner, or aren’t a part of a training group, go out and find one. Ask around at local running stores (chances are they have one themselves), check on meetup.com and rrca.org, or find a specialty group in your area (like the brand new No Meat Athlete groups). And when you do have a partner, make sure you’re taking proper care of that relationship. 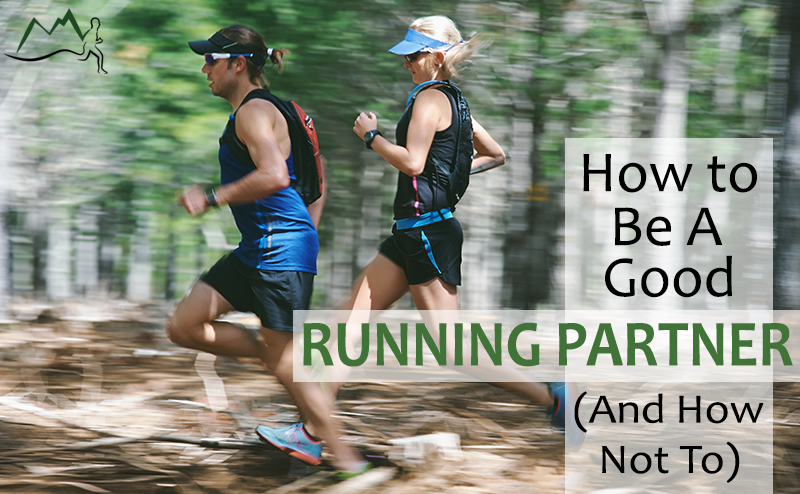 Here are my rules for being a good running partner. To be a great running partner, you need to actually show up. And be consistent about showing up. That means scheduling regular runs with your partner or group and sticking to them. Being consistent gives you the chance to get to know the other runners as runners (even if you hang out with them outside of runs regularly), so that you can understand their needs and goals. It also establishes regular accountability, and provides the opportunity to check in with each other’s training. When the Rock Creek Runners group first started out in DC, we were super inconsistent (my fault! ), and while we always had a good time, it was hard to take advantage of what everyone in the group had to offer because we hardly knew each other. Being a good running partner means being a good friend. Throughout the run, especially if your partner is struggling, support them. Offer words of encouragement and keep the energy positive. When you’re struggling, don’t isolate yourself, but instead let your partner or the group encourage you. For the most part running is a solo sport. Having a partner adds a team dynamic, and a good team carries each other along when they need to. When I run by myself, I know what paces and workouts I’m comfortable with. Part of what makes running with others so beneficial is that it often removes that level of comfort. All of a sudden, you have match the pace of someone else, even if your tired or a little sore. And workouts that might not be a part of your regular routine could be suggested by your partner. Push your partner and let them push you outside of that comfortable area, and I can almost guarantee you’ll notice positive changes when you’re left running alone. Probably the number 1 reason people like going to running groups or running with a partner is the social aspect. It’s fun, distracting, and removes that layer of loneliness many people feel running solo. So chatting with your partner is usually a good thing. Talk about training, racing, life, and work. Just don’t talk their ear off. If a runner’s struggling, they usually want a little quiet. Running partners aren’t just good for training. They’re also helpful on race day. Not only are you, as a running partner, uniquely in the know about where they are about their training, you’re also someone they feel comfortable suffering around. Get out there on race day to cheer them on. Trail and ultra runners often have the opportunity to crew or pace their partners. If someone asks you, do it. There’s nothing like someone running by your side deep into an ultra that already knows you as a runner. And you just might need the favor returned some day yourself. Do they like to chat or run in silence? What are they’re strengths and weaknesses? Do they like tough love or gentle encouragement? These are they types of things you want to know about your partner. And you want them to know about you. A little friendly competition to get stronger is one thing, trying to impress the other or show your partner up is another. If you want to be invited back, put your ego aside and don’t make training runs a competition when they shouldn’t be. It’s tempting, I know. I’ve been known to do it myself. But this isn’t the time to see who’s got the bigger…shoes. Don’t stand your partner up. Don’t talk back. Don’t get angry with them when you aren’t feeling good. This takes us back to offering words of encouragement. Are You A Good Running Partner? So what do you think? Are you a good running partner? Even though I’ve run 95% of my runs over the past year alone, some of my favorite memories are ones when I ran with other people. Whether they were group runs, epic adventures, or just causal runs with a friend. It’s just as rewarding to be a running partner as it is to have one. So go out and be one. Just make sure you’re a good one. Call for comments: Do you have a regular running partner or group that you like? What makes them so good?